I don’t know about you, but I can’t believe how fast this year is flying on by! I wanted to do a check-in with you to see how you are doing on your goals for this year. Are you rocking and rolling on them, or are moving slower than you want on them or have totally stopped on them? I want to let you know that it is definitely not too late to get started. It’s never too late to get started but why wait a day longer? People are waiting for your gifts! They are waiting to hear your story and for you to share your expertise. I am here today to inspire you to really invest in yourself if you are not already doing so. As I said, life is flying by and I want you to have amazing happiness and success! To Become Your Very Best – If you are not at your very best, you will never give your very best to others personally or professionally. In order to give your best to your loved ones and to those in your professional life, you need to invest in yourself to fully know yourself and have the best tools and resources. I love the quote by Og Mandino “Take the attitude of a student, never be too big to ask questions, never know too much to learn something new.” It is so true that we can always learn something new in life, so we must know that personal development is not a one time thing. Personal development must be an ongoing thing. Always be a learner; learning things to better yourself and find ways to work smarter. Focus on the Right Things – When you invest in yourself in the right way, you should learn some really great things about yourself. You will learn about what makes you happy in life and what things you should focus in on career and/or business-wise. When we try to deal with things on our own, sometimes we can feel stuck or not go in the right direction. And it’s not because we are not trying to do our best, but there can be blocks from uncovering it. When working with a mentor or coach, it can uncover great things about ourselves and what we should really be focusing in on for our business to have our greatest success and happiness. Achieve Goals Quicker– Investing in yourself is so important because with the right tools and resources, you may be able to achieve your goals quicker! This is because when you are doing things on your own, you may make some mistakes along the way. Now mistakes are good to make; it’s part of life. But if there are clear paths that you can take without making errors that take you off your path, that will help you achieve what you want quicker. 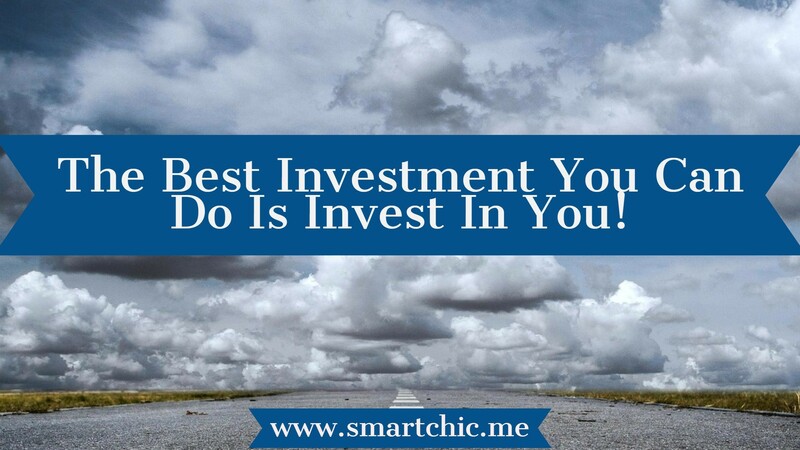 So investing in yourself can help you get on the straighter path. Alone you can do a lot, but with the right tools and resources, you can achieve what you want quicker! Get Confidence – We all need confidence in our lives. We may be confident in one particular area of our life, but something that we are working on, we may not be so much. Investing in yourself is super important, especially when stepping out of your comfort zone because it can help you gain confidence in that area. So for example, if you are trying to become a better speaker, often people will go to Toastmasters to get better at presenting. That’s an excellent way to practice public speaking. Another great way to gain confidence is running your ideas off an accountability partner, mentor or coach. The right one will cheer you on and support you all the way. Confidence is needed to be your very best and investing in yourself is an awesome investment to gain it! Open Up New Possibilities / Opportunities – Investing in yourself can help you gain amazing possibilities and opportunities! When you get the training, coaching or mentoring that you need, you think of new, innovative ways to get yourself out there personally and professionally. A great example is learning all of the latest social media platforms. Recently I was teaching one of my clients how to gain major exposure of his brand by taking to the airwaves of live streaming and how to re-purpose that information. This opened his opportunities to new revenue streams. Start taking the blinders off to what you were always programmed in. Gain new possibilities and opportunities. You are worth it – The bottom line about investing in yourself is that you really need to do it because you are totally worth it! You may have given so much of yourself to everyone else for so many years. I totally believe that now is YOUR time. It is time for you to dig deep into what makes you happy right now and to give yourself the right tools and resources to be as successful as you can be. What are the different ways that you invest in yourself? Have you invested in your personal development by getting the training that you want or receiving mentoring? If you haven’t put yourself first in personal development, is this something that you would like to explore? Learn more about it? I’d love your comments below and/or reach out to me here. I’d love to schedule a virtual coffee with you and see how I can best support you personally and professionally!